New parents should read Freakonomics, than watching it. Note: This is not a book review, but sharing what I think is interesting for young parents like me. Update [02-18-2014]: I’ve modified the title from “Young parents should read Freakonomics, than watching it”, as I see that “New Parents” fits better than “Young Parents”. 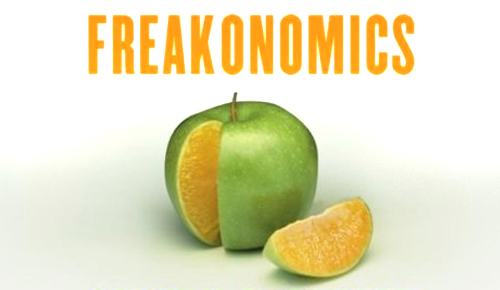 I was introduced to Freakonomics through the movie in Netflix in 2011 and I watched it again in 2014 in Amazon Prime. What difference did it make? Well, it made a huge difference. I’m now lending my ears to any information regarding Parenting, Child Behavior and their education. And Freakonomics has exactly these things which did matter to me in 2014 than in 2010. Contrary to my initial perception, the movie didn’t talk about economy, fiscal or monetary stuffs. I believed book would be the same too. After watching the movie, I thought reading the book will supplement the information and also I’ve kind of had an idea that mostly movies are just 20% of what says( with my experience from Da Vinci Code and Angels & Demons). So, I gladly picked up a book from Austin Milwood library. And gave a glance on Table of contents. Starting from “Hidden side of everything” to “Parenting”, every title had a brief overview of what the topic is going to teach about. And once I started reading, I completed in two sittings. It is not just the book is small ( 200 pages - for me, anything beyond 20 page is a lot), but the facts, questions and conclusions are astounding and interesting. Well again this book defeated my initial assumption(supplementing the movie), it was nothing close to it. The movie is more like an tip of the iceberg. Though the book explores various aspects of society such as Crime, Names, Lying, Groups and Business etc., the reason for me to pick up the book is knowing the observations and conclusions of this one of the celebrated, Harvard educated Scholar on Parenting. So let me jump straight there. Also he also mentioned, Asian kids does better than American kids. And I assume the term Asian in a broad range to include Indians, even thought most of the time it mentions Chinese and Far eastern countries. Though Levitt’s conclusions certainly triggers some thought about some conventional parenting, but doesn’t mean his conclusions are absolute truth. You should have your own discretion on deciding what is good and correct for your kid.